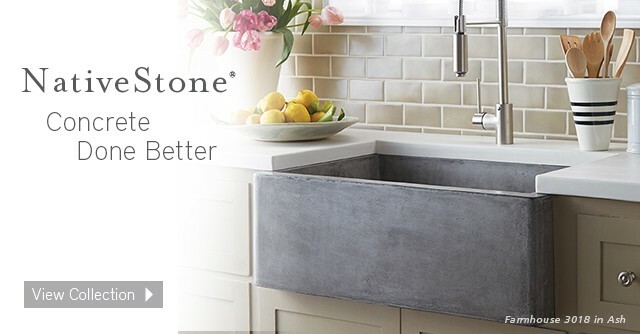 Introduced by Native Trails in 2014, NativeStone is an innovative, remarkably strong new material used to make the NativeStone collection of kitchen, bar/prep, and bath sinks. Like concrete, NativeStone is made using cement and other materials. But NativeStone is not your typical concrete. It sustainably blends raw natural materials, including cement with renewable jute fiber. When mixed with cement, the jute fiber permeates throughout the material, dramatically increasing the concrete’s strength and resistance to cracking, while creating a dramatically lighter product – approximately 40 percent lighter than traditional concrete sinks. We also use an exclusive low-VOC nano sealer that literally binds with the molecules in the concrete. This makes NativeStone exceptionally stain resistant, crack resistant, and scratch resistant. How is a NativeStone sink different from a traditional concrete sink? NativeStone sinks are handmade by artisans using a groundbreaking blend of natural materials and sealed with a cutting edge nano sealer. NativeStone sinks are 40 percent lighter than traditional concrete sinks, and are exceptionally stain, crack, and scratch resistant. How are NativeStone products reinforced? Our NativeStone Collection is reinforced with natural jute fiber, an incredibly strong and sustainable material. The result is a much lighter weight product, about 40 percent lighter than standard concrete, as well as an extremely crack-resistant product. In the unlikely event that a hairline crack does develop, it is not structural and the product is not considered to be defective. What is the Jute fiber that is used in NativeStone? Jute is an inherently durable and resilient vegetable fiber traditionally used for making rope, twine and heavy duty packaging. The jute used in each NativeStone sink is grown locally, near the artisans’ workshops – which ties in perfectly to Native Trails’ eco-friendly initiative to support local communities. Jute is a renewable resource, as it grows in tropical, wet climates and does not rely on fertilizer to grow. In addition, jute is also 100 percent biodegradable and recyclable. How do I maintain my NativeStone sink? For care and maintenance of our concrete sinks, simply use mild, non-abrasive soap and cleaners. The sealer is highly stain and scratch resistant; however, normal care should be exercised and abrasives avoided. Wipe or rinse sink after use. Will hot pans damage my NativeStone kitchen sink? While our nano sealer will withstand high heat, we recommend allowing hot pots and pans to cool before placing in the sink. Does NativeStone come in different colors? NativeStone currently comes in three finishes: Ash, which is a light, natural gray color with beautiful natural mottling; Slate, a rich, dark grey; and Pearl, a luminescent cream color. The only customization we currently offer related to NativeStone is adding extra faucet holes to the trough sinks. Can I install a NativeStone sink outdoors? Yes! NativeStone sinks are remarkably strong, and exceptionally stain resistant, crack resistant, and scratch resistant. And our exclusive low-VOC nano sealer is UV safe. Can I install a NativeStone sink in the laundry room? Yes! NativeStone sinks are remarkably strong, and exceptionally stain resistant, crack resistant, and scratch resistant. And our exclusive low-VOC nano sealer ensures the sinks are not affected by bleach. Do I need to buy a Native Trails drain with my sink? Our exceptionally high quality drains are designed to work with Native Trails sinks, and they do have some differentiating features. For example, they work well with either thicker-walled sinks (such as NativeStone) or thin walled sinks such as copper. Our lavatory drains thread all the way up to ensure a tight seal, a key requirement for our copper sinks. Our drains are also designed for sinks without overflows, like ours. We cannot ensure that another manufacturer’s drain will work with our sinks. Are NativeStone sinks UPC compliant? Yes. 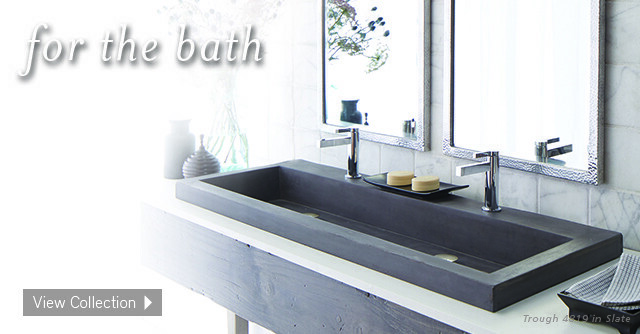 All Native Trails sinks and bathtubs are UPC/cUPC compliant, facilitating their use in all types of projects. Uniform Plumbing Code (UPC) governs the installation and inspection of plumbing systems as a means of promoting the public’s health, safety and welfare. Commercial projects normally require UPC compliance and it is also required in many regions for new residential construction. Our products and facilities are regularly inspected to ensure compliance. Does Native Trails supply templates for the NativeStone basins? Due to the inherent variation in dimensions of our handcrafted concrete sinks, we do not supply templates. We highly recommend waiting to receive your actual sink before making any cuts in the counter top. However, we do have spec sheets available on each product page of our website, nativetrailshome.com. Do your vanity tops come pre-cut for your NativeStone lavatory sinks? Yes; you may choose the cut-out configuration to match your NativeStone concrete sink and faucet on our website, at nativetrailshome.com/cut-outs/. If you require a different faucet placement, or a vanity top with no cut-outs, we can easily accommodate your needs upon request.